A cooling market could increase the downside risks to the world’s second-largest economy, which faces broader headwinds including an intensifying trade war with the United States. Click here for full article. Walt Disney Co’s Q4 earnings provided clarity about the new streaming service, Disney+, set to rival Netflix, Inc. late next year. How is Investment Real Estate doing in Canada? According to the latest snapshot report by Altus Group, a real estate consulting and data analytics firm, demand for investment property continues to be strong despite some roadblocks. Every quarter, Altus Group surveys over 200 investors, owners, lenders, analysts and other market stakeholders and real estate professionals for their perspective on Canadian real estate investments. As recent news (including one of our latest articles) already pointed out, the large availability of private capital is driving up prices in a number of assets across the investment spectrum. Real estate is no different, with some sectors seeing cap rates compressing more than others. According to the report, overall capitalization rates compressed slightly to 5.03%, compared to 5.13% from a year ago. Cap rate compression is usually attributed to increased prices due to higher competition for properties. As more capital seeks investment real estate, prices are bid up even though properties haven’t necessarily increased their Net Operating Income (NOI). Consider the High-Grade, Class “AA” Office Sector for example. Altus reports that cap rates for Toronto and Halifax moderately increased, with most other markets marginally decreasing. Given strong demand for investment real estate, the high-quality office product in core markets becomes a more highly-competitive, scarce commodity driving investors to look for yields in other more attractive markets. A similar effect happens in the multi-family sector. Higher prices for residential product amid the housing affordability crisis we are facing in major Canadian markets is driving cap rates down, forcing investors to seek opportunities in secondary and tertiary markets, while also forcing home buyers to postpone their decision to buy. The only markets not experiencing cap rate compression are Ottawa (which saw a marginal increase) and Halifax (which remained flat). For industrial real estate, the investment environment is very attractive. Canada’s eventful last week, with LNG Canada‘s final investment decision on a $40-billion project and the redrawing of the new NAFTA (USMCA) negotiations, will bring many benefits to the economy. Manufacturing and other industrial-real estate related properties stand to benefit the most from such current events. Thus, it comes as no surprise that the top three product/market combinations advanced by Altus’ survey are all multi-tenant industrial in Ottawa, Edmonton, and Calgary. Having the highest average cap rate across markets from all asset classes (at 5.58% for single tenant industrial), increasing rents across Canada due to demand outpacing supply, and advances in e-commerce should make for a great case for the sector. What about the impact of interest rate increases? For the short to medium term, Altus notes that commercial real estate in Canada has not caught up entirely to the impact of the recent increases, so cap rates are expected to hold steady with moderate increases in certain markets. Strong demand outpacing supply and large availability of capital is great economic news for the country overall. Despite the cautious approach from investors in such a high-priced market, there is good reason for the large investment volumes seen in the recent quarters. To access Altus Group’s Investment Trends Snapshot, click here. 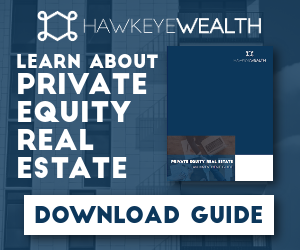 Sign up for Hawkeye’s Newsletter for Market Updates, Upcoming Events and Private Offerings by clicking here.